eCommerce Shopping Cart Software Templates to customize your shopping cart software. — Modular Merchant's templates make it quick and easy to customize the look of your online store! Basic black never goes out of style, which Harper demonstrates. This template focuses the attention on your products and content, while keeping the navigation clear and easy to use. How to install templates in your online store. Options to sort products by their price, name, availability status, and more. View products in either a list or grid format. Display a slide show on any store page. Display unlimited product images and variations. Supports all store pages, including: search, product details, categories, vendors, checkout, contact and additional content pages. 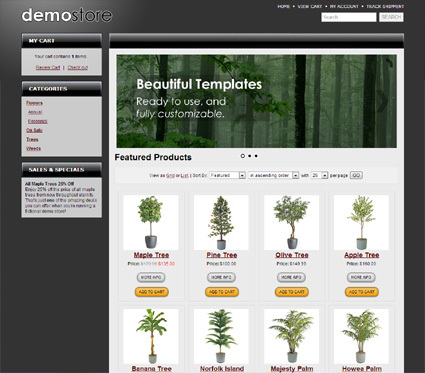 See our demo store using this template. How do I install a Template Package? Option 1: Install the template with one click. Use this option to install one of the many free templates that are available. First, log in to your store's Administration Area, and navigate to the Get Template Packages page at [Design > Get Template Packages]. This page lists the templates that can be installed directly within your store's Administration Area. Multiple templates can be installed, but only one will be applied to your public storefront at a time. An example of browsing a list of available templates within the store's Administration Area. Browse the selection of templates, and locate one that you would like to install. If it has not yet been installed in your account, it will have a link titled Install. Clicking this link will automatically install the latest version of the selected template into your shopping cart. It will then be ready to use! If a template has already been installed in your store, then a link titled Reinstall will be listed. This link can be used to install a fresh copy of the template in your shopping cart. Any previous versions, including any customizations that have been made to the template since it was first installed, will be replaced with a copy of the latest version. Option 2: Upload and install a template. Use this option to upload a template that you have downloaded or designed yourself. First, log in to your store's Administration Area, and navigate to the Template Package Sandbox page at [Design > Template Package Sandbox]. This page contains several options for working with templates. Locate the section of the page titled Select a Template Package. Select Upload a Template Package from the dropdown menu in this section. Selecting the Upload a Template Package option will display a field on the right that allows you to browse your computer for a template package and upload it. After the template has been uploaded and installed, it will be available for use. To apply it to your store, make it your store's "live" template! More information about the options that are available for managing templates is available in the Template Package Sandbox article in the Modular Merchant knowledge base. The article covers installing templates, plus previewing, cloning, and downloading them — and more.